The clock is ticking down on the upcoming release of Battlefield 5, and the team at EA Dice know that players' trigger fingers are starting to get itchy. That's one of the reasons why they're gearing up to launch a special closed alpha test, to give players a chance to check out the latest shooter sensation and get a feel for all of the biggest changes coming to the Battlefield formula. However, the upcoming alpha is a closed test, meaning not everyone will be eligible for participation. Fortunately, we've rounded together all of the details players need to know to sign up and potentially earn an invite for alpha, including system requirements that can tell whether or not their PCs are up to the task. Since the Battlefield 5 closed beta test is invite-only, there's no real procedure to sign up for it. Instead, speaking over on the Battlefield website, the developers have stated that "invitations with codes for the closed alpha will soon be sent to a small group of Battlefield players. These codes can be redeemed in the Origin client." It's possible that players who receive invites are those who have logged a fair amount of time into previous Battlefield releases and/or have engaged in the community through Twitch streams or other social media networking. It's also possible, though certainly not guaranteed, that EA DICE will eventually send out more invitations throughout the course of the alpha. When Does The Battlefield 5 Closed Beta Begin and End? Details here are sparse — EA DICE has only stated that the Battlefield 5 closed alpha will begin on June 28, and beyond that, that it will only "be available for a limited time." Players can likely expect a few days, though if things seem to be going well, EA DICE may extend the closed alpha period. The Battlefield 5 closed alpha test is limited to PC players, specifically to those with mid- to high-range PC hardware. The minimum requirements are fairly steep, so players who want to jump in to the alpha would do well to check their system specifications against those provided by EA DICE. The developers have noted that these specifications are meant solely for the Battlefield 5 closed alpha test and do not necessarily reflect the minimum or recommended system requirements for the final version of the game. What Will Be Included In The Battlefield 5 Closed Alpha? As Battlefield 5 is still under development, the closed alpha won't have everything that players can expect from the full release of the game. 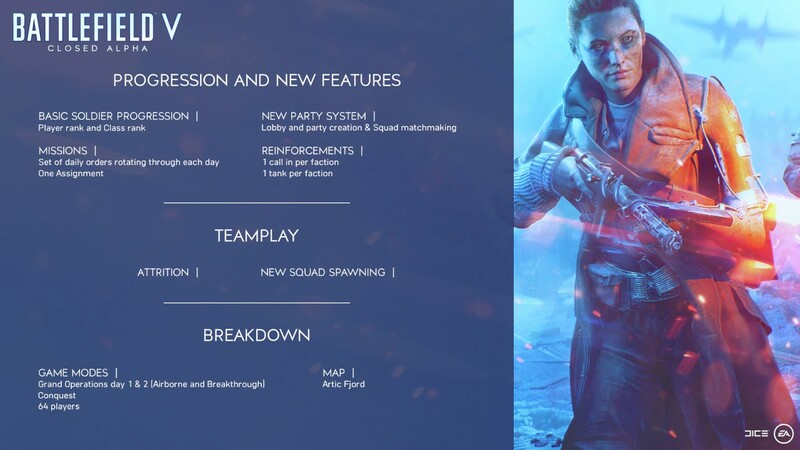 However, the alpha will have a number of features that players can look forward to, including a glimpse at the Grand Operations and Conquest game modes including both Airborne and Breakthrough missions, basic soldier progression, a look at the party system, and an in-depth look at the Arctic Fjord map. For a more in-depth breakdown of all the other features that will be found in the beta, be sure to check out our guide to the classes, weapons, reinforcements, tanks, planes, and gadgets featured in the Battlefield 5 closed alpha. For more great coverage of all things related to EA DICE's latest World War 2 experience, keep it tuned to Shacknews' Battlefield 5 home page.